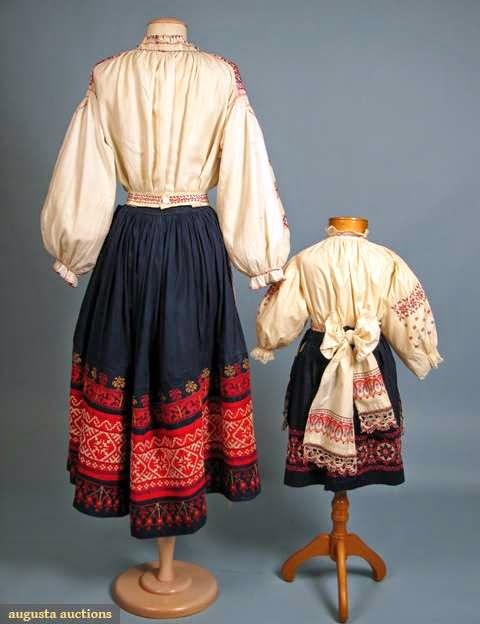 Today I will talk about a type of outfit which is not a Folk Costume at all. These come on the market now and again, and people ask me about them. 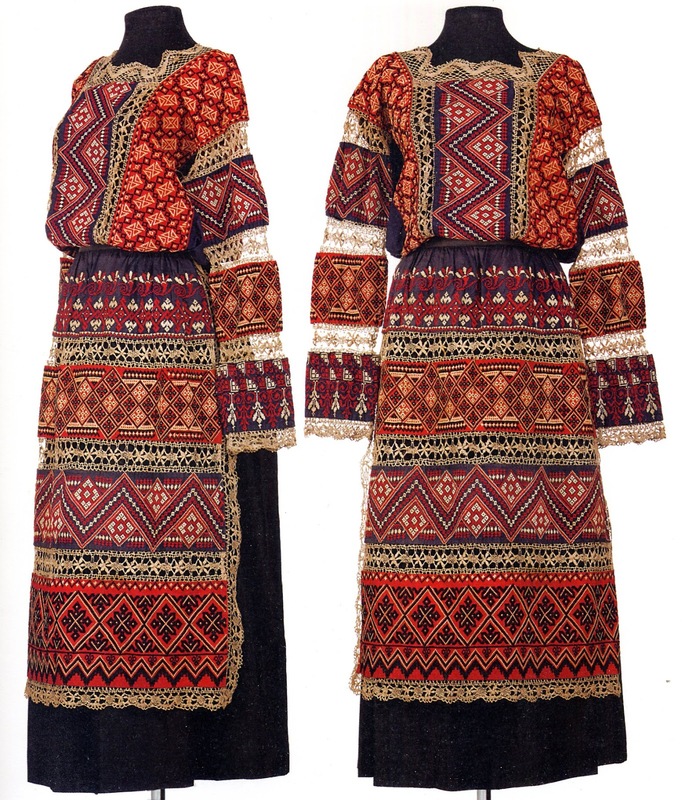 This is what may be called Russian Town costume. 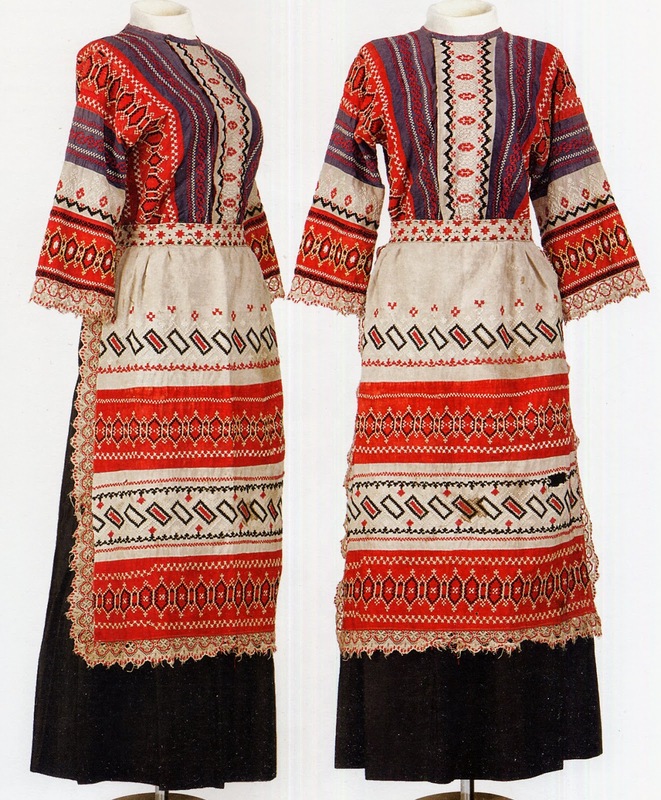 These were never worn by peasants and are not part of the Russian folk costume tradition. 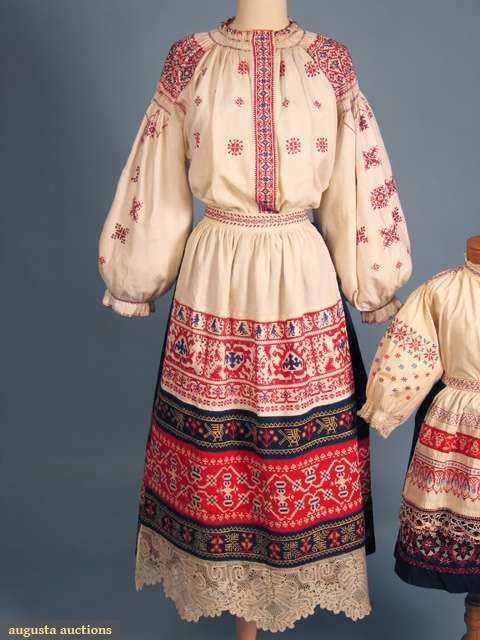 The cut and construction of these outfits are not Russian or traditional. 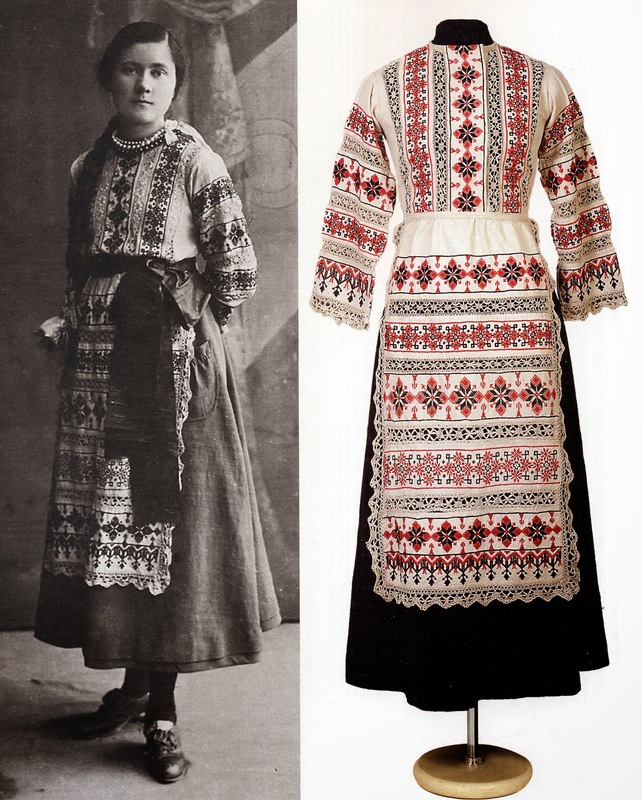 They are basically Victorian era garb covered with embroidery and utilizing Russian folk lace. 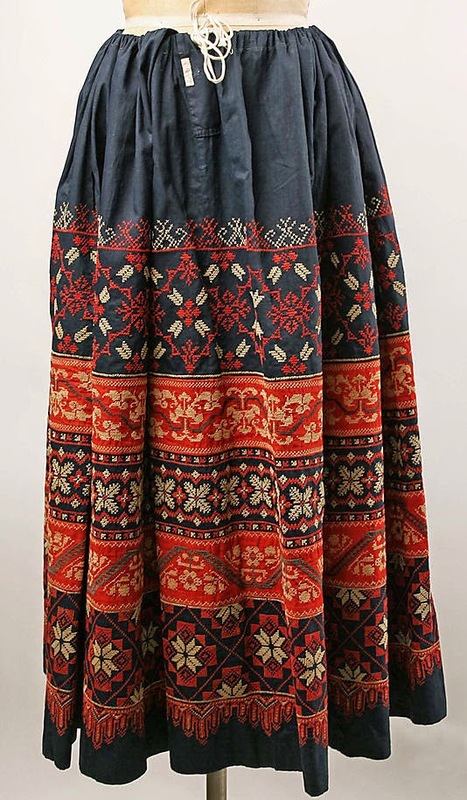 These were made to order in the latter 1800's, and were marketed to women who lived in towns and cities who wanted to have something 'Folky' to wear for singing folk songs or to express their cultural heritage without the embarrassment of wearing Peasant Clothing, which would just never do. They incidentally provided work for many women of the towns and villages who made the pieces. 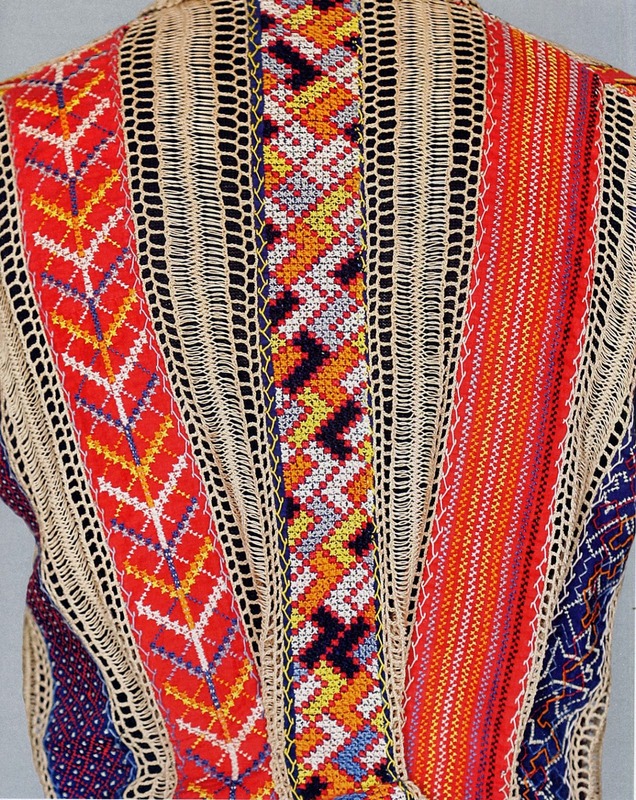 These garments were constructed in strips, as you can see above. 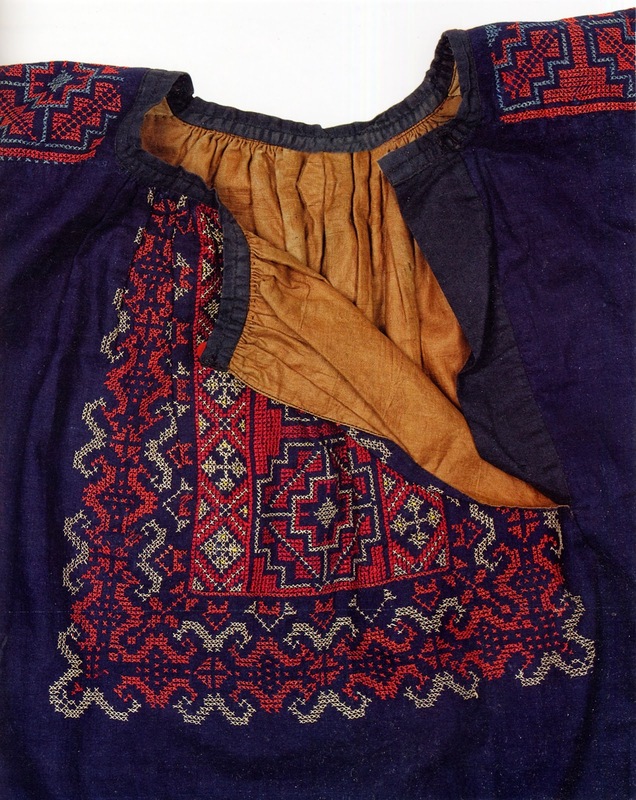 Individual bands were embroidered on blue, red, yellow, or other colored cloth with waste canvas, and then these bands were sewn together to make garments, the various strips usually being joined with a length of peasant lace sewn in between, which also adorned the hems. 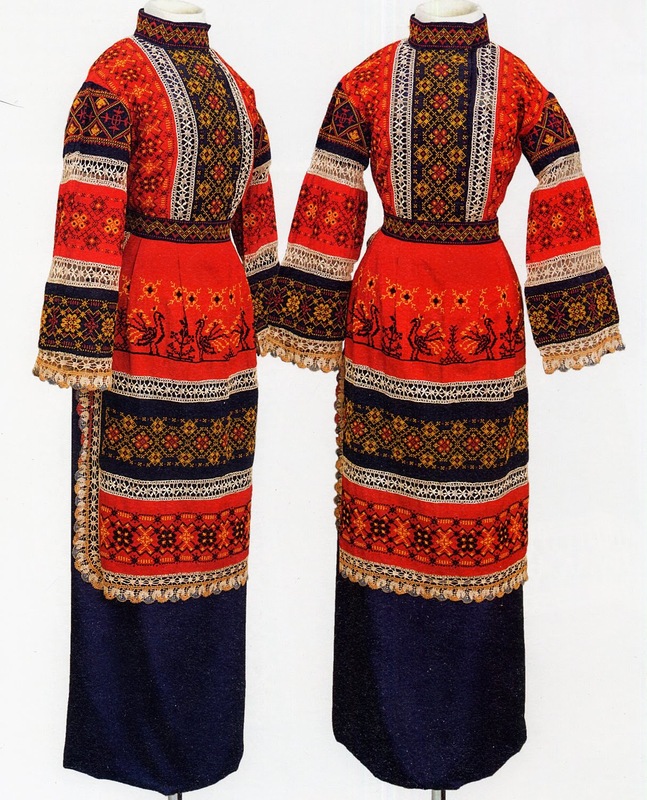 The ensembles generally consisted of a blouse, that is, a top with wide sleeves, standing collar and side closure in the front, an apron, and sometimes a skirt. 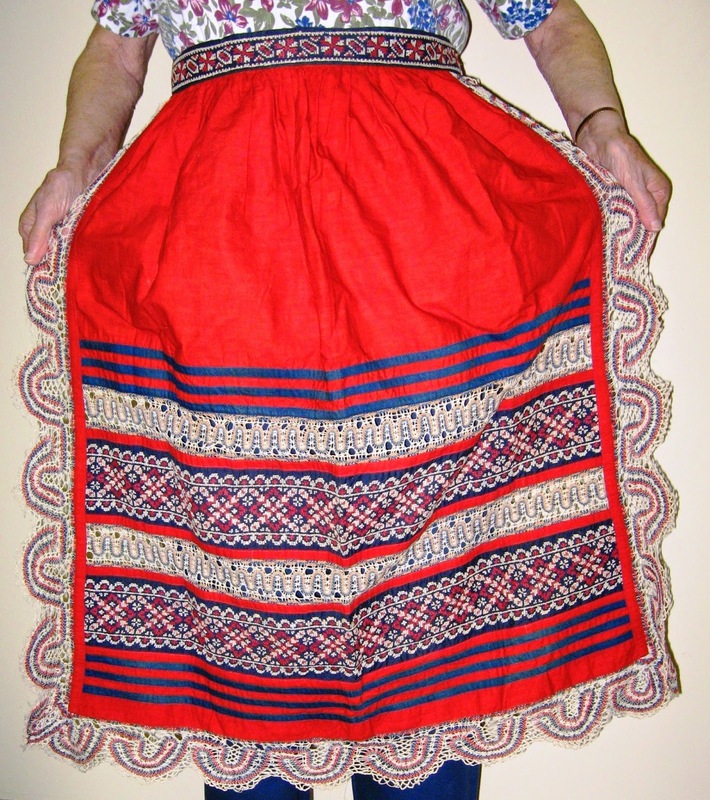 If not, regular Victorian skirts would then be worn with them, as we see here above. 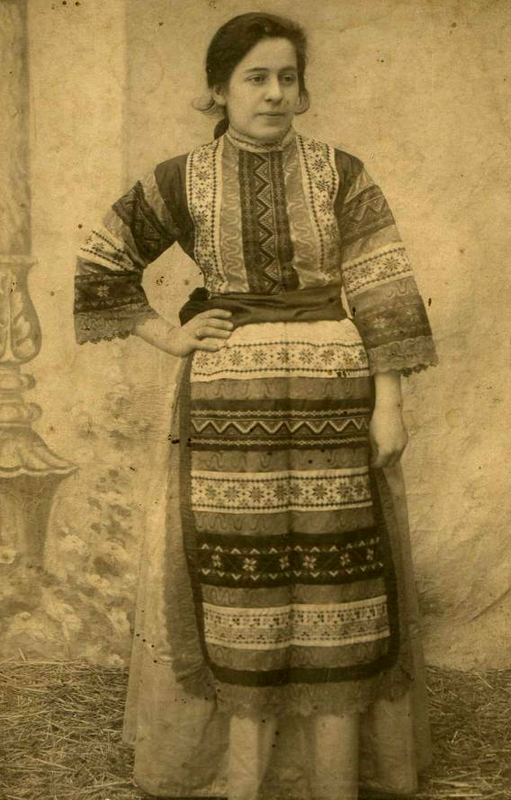 The cut of the blouse, kofte, is not completely Victorian, The body is a simple square, and the sleeves are sewn to the body at right angles, often with a gusset under the arms. This is a very simple cut and easily made from the embroidered bands. The strips of lace between the bands made the blouses semi transparent, but of course, the lady would wear chemise, corset and camisole under them. 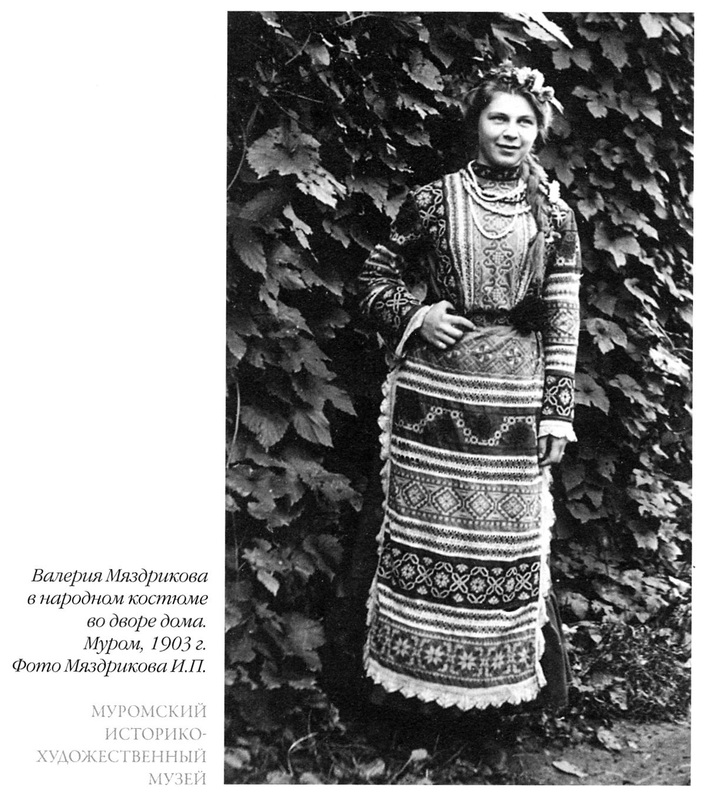 The lace indeed resembles that used in some Russian and Karelian folk costumes, although it is not used in the same way. 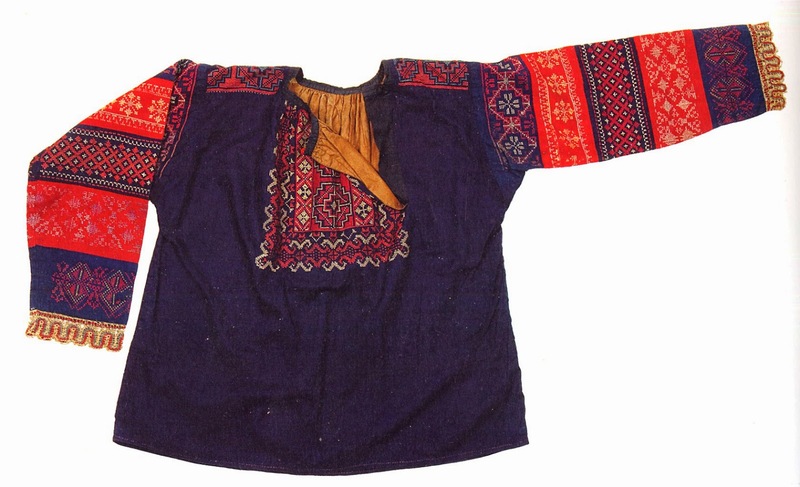 The origin of the embroidery, however, is a bit of a mystery. 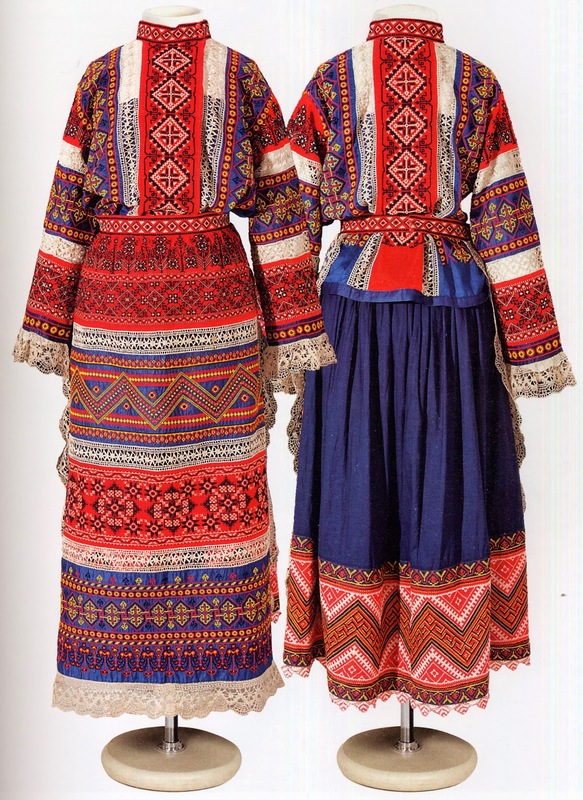 If you peruse good books on Russian Folk Costume, you will not find embroidery which resembles what is found on these outfits. 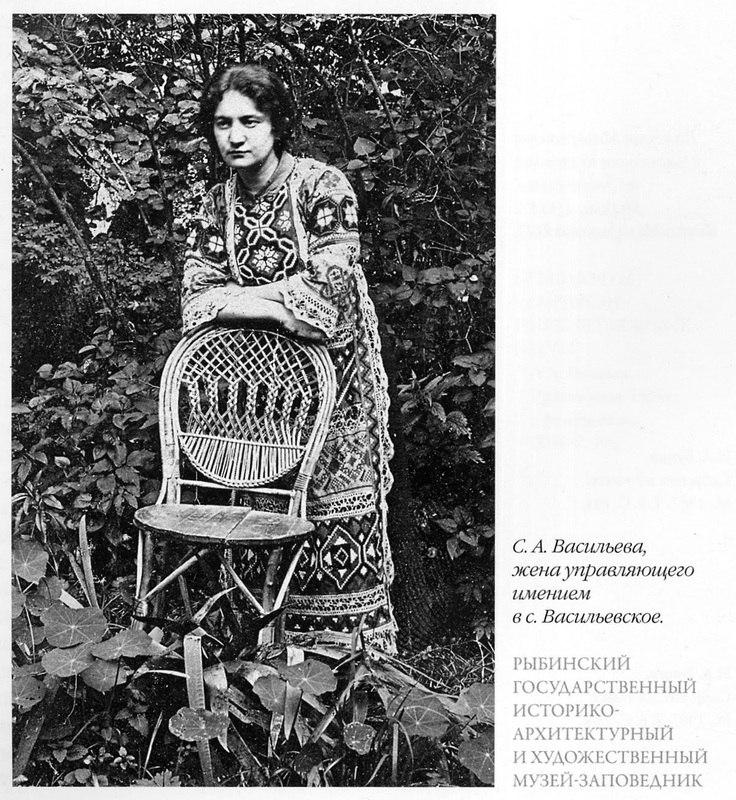 Indeed, cross stitch is very rare in traditional Russian costume. So then where did these designs come from? 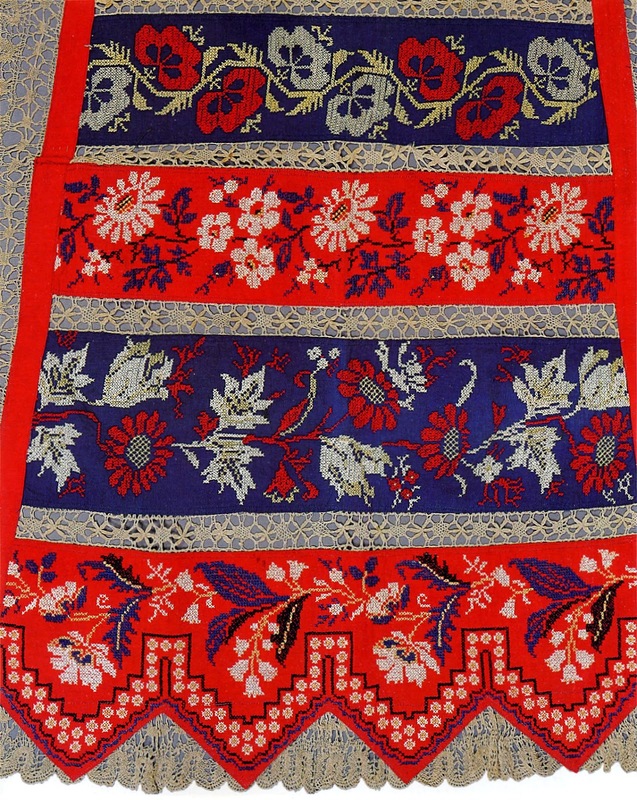 The short answer is that they were the product of the printing of books of embroidery patterns. 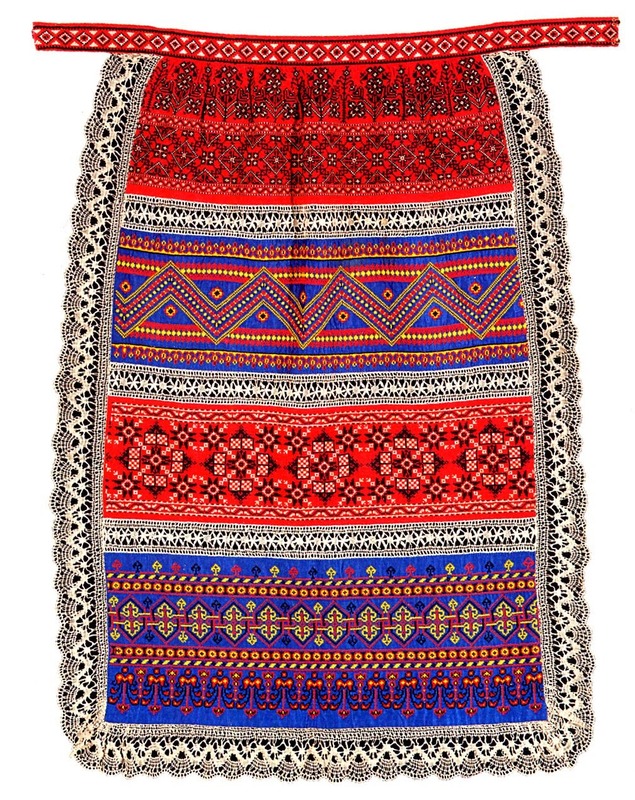 These began to be distributed in the mid 1800's, and are often referred to generically as 'Brokar' patterns. A certain Henrykh Brokar, who is consistently referred to as being French, opened a factory which made colognes, perfumes and soap in Moscow in 1864. As part of their marketing strategy, they included a sheet of graphed embroidery patterns as a premium. Here is an example. As the soap especially was widely sold in the Russian Empire, these designs became very popular in some areas. 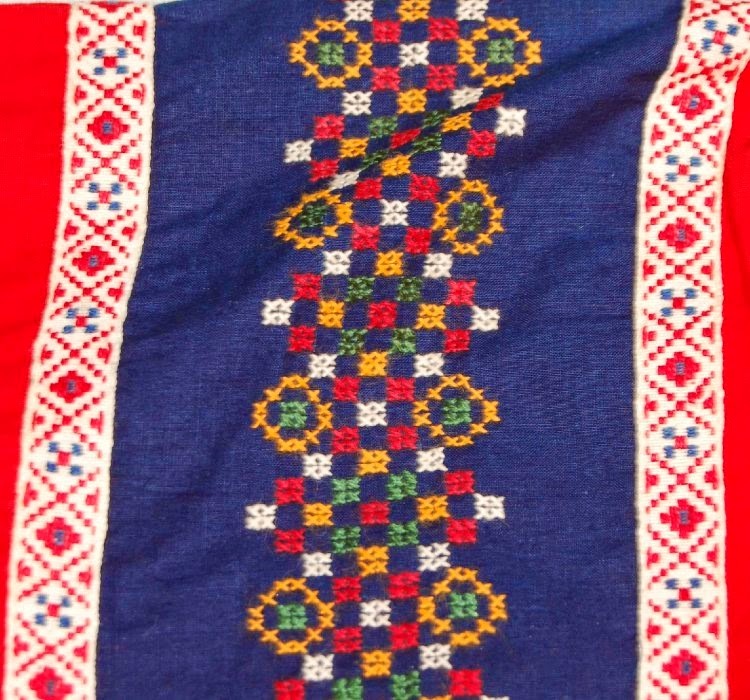 Others also published books of folk designs. But this just puts the question back one step. Where did Brokar's people and the others get the designs in the first place? 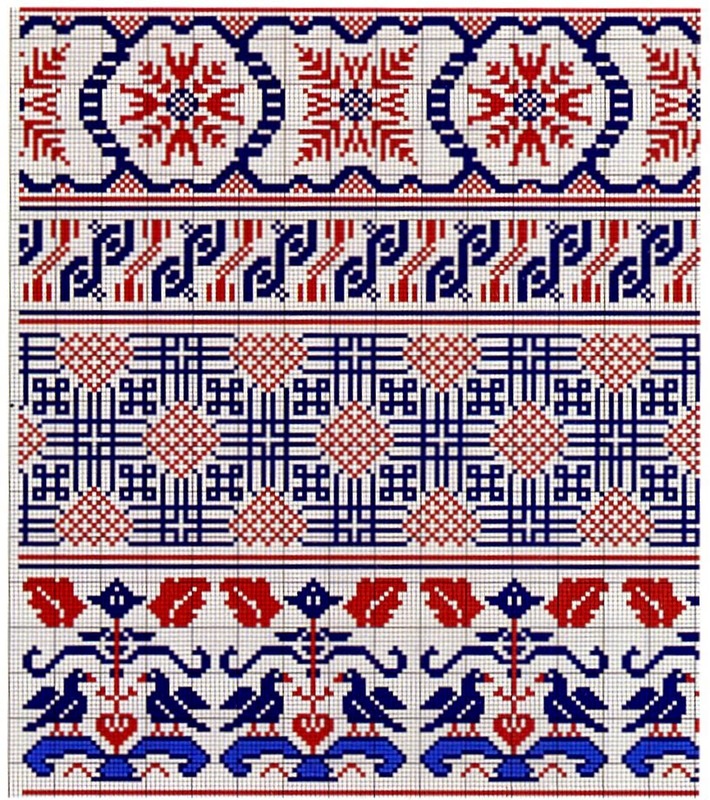 If you look at this design above, the central motif is very typical of cross stitch designs found in Ukraine and Romania today, but the border looks like it was designed by a Victorian mindset. Others, like this one, are very simple and were likely made up by people in the factory. Brokar's competitors soon started copying this strategy, and soon many such designs were to be found floating around. 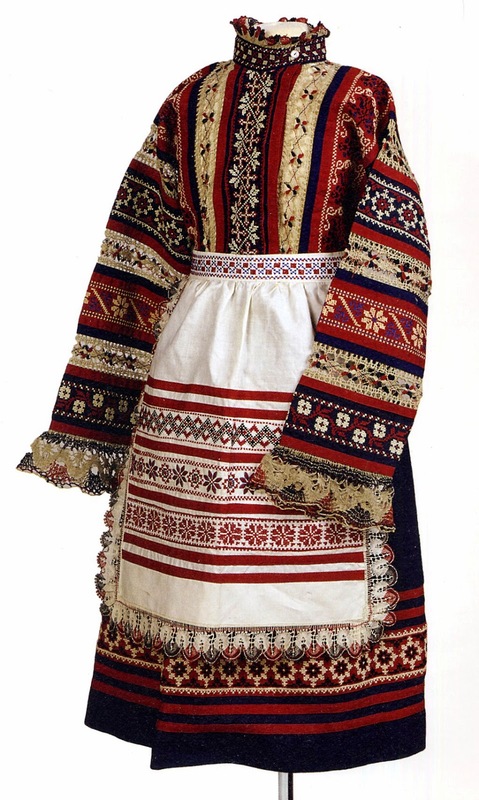 Some obviously made up, some based on actual Slavic weaving or embroidery designs in other techniques, some from other cultures. These became popular in the cities, but did not penetrate much into the Russian villages. 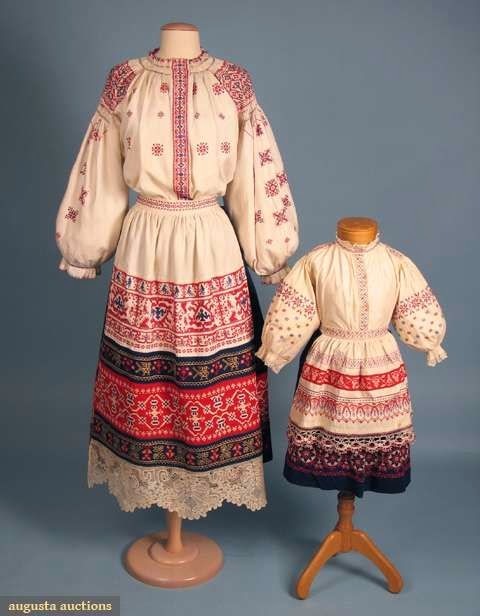 In Ukraine and Belorus, however, they did in some places become part of the culture, or perhaps the designs were drawn from their culture, as many of them, including the designs used on the Russian Town Costumes greatly resembled embroideries used by the Ukrainian and Belorussian people who were not part of the Russian Empire. This issue is not resolved, and needs more study. 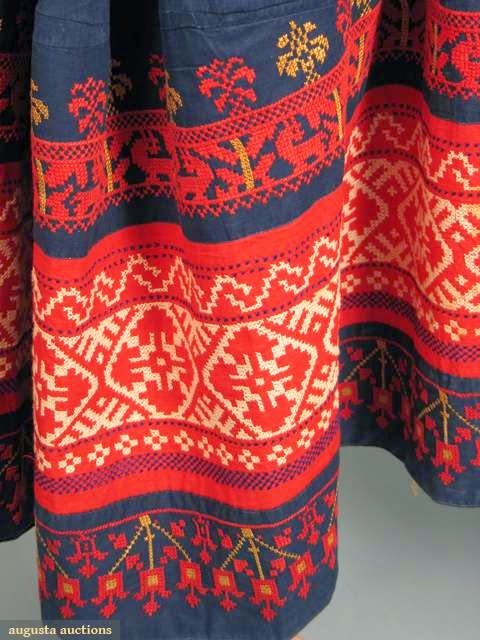 Some of these designs could easily be from Switzerland or Germany, and yet there is a body of designs which form a recogniseable style, distinct from those of western Europe. 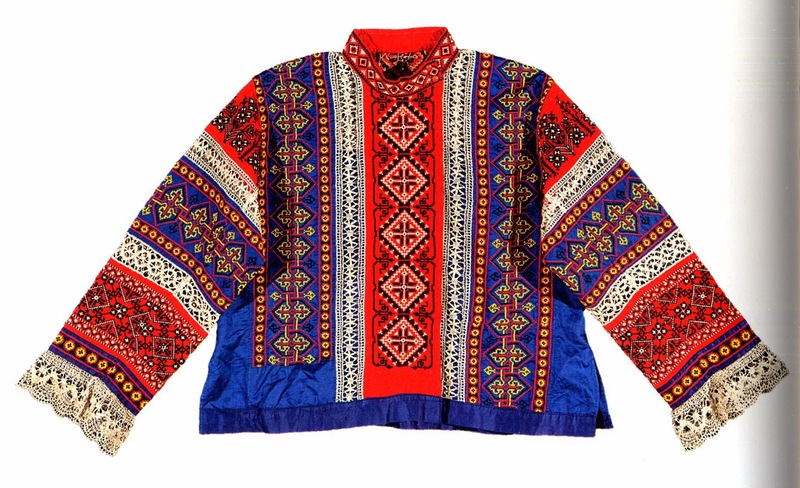 which is found in Ukrainian, Belorussian, and some Russian embroideries. 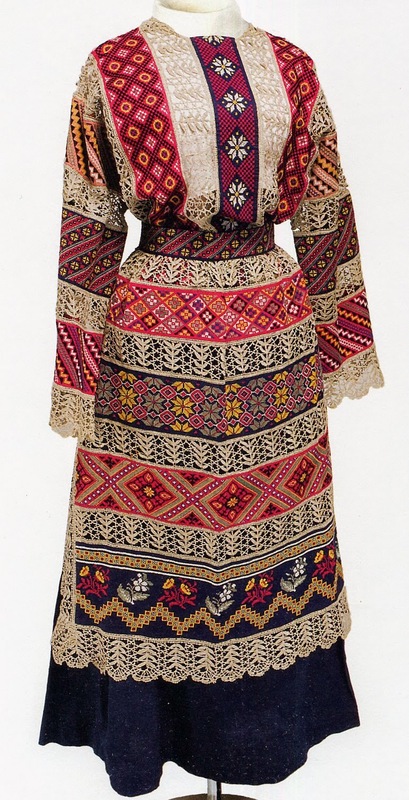 There were catalogues of these costumes printed from which women could select different styles. Also, since the constituent bands were made separately, the customers could choose which colors and which designs they wanted to have included. 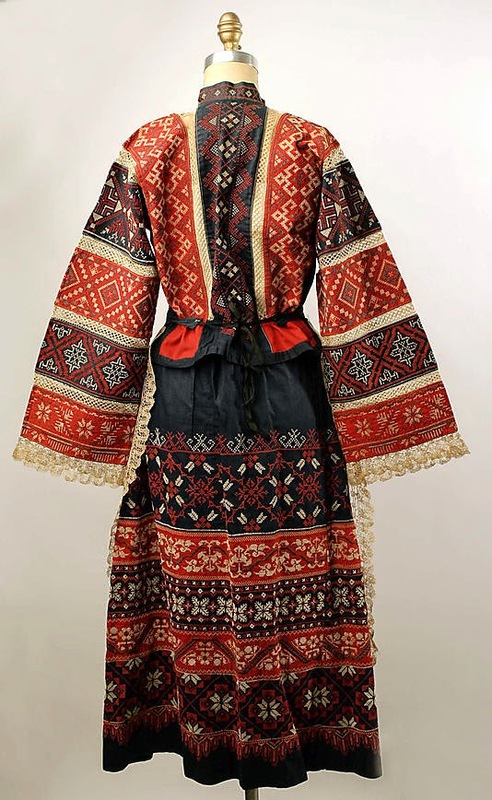 One innovation of these costumes is that the embroidery was not done on white linen, but on colored factory made cloth, which necessitated a shift in the colors of the embroidery. 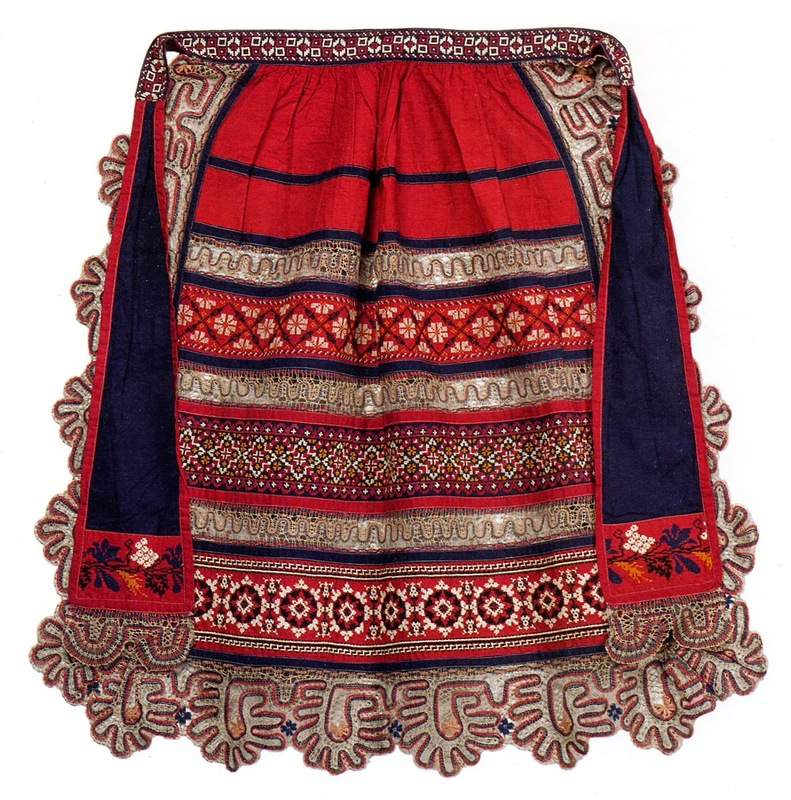 When the ensemble included a skirt, the embroidery on the skirt was usually restricted to a band around the hem or in the center, but was sometimes expanded to cover most of the skirt. 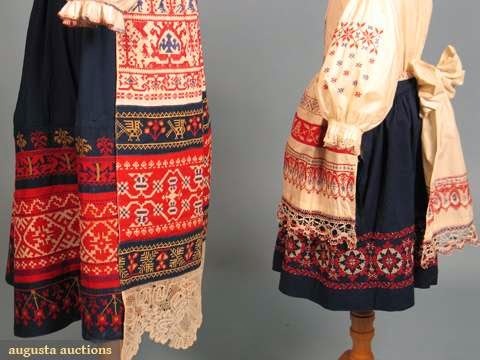 This next one is somewhat unusual, it seems to consist of just a fichu and an apron. 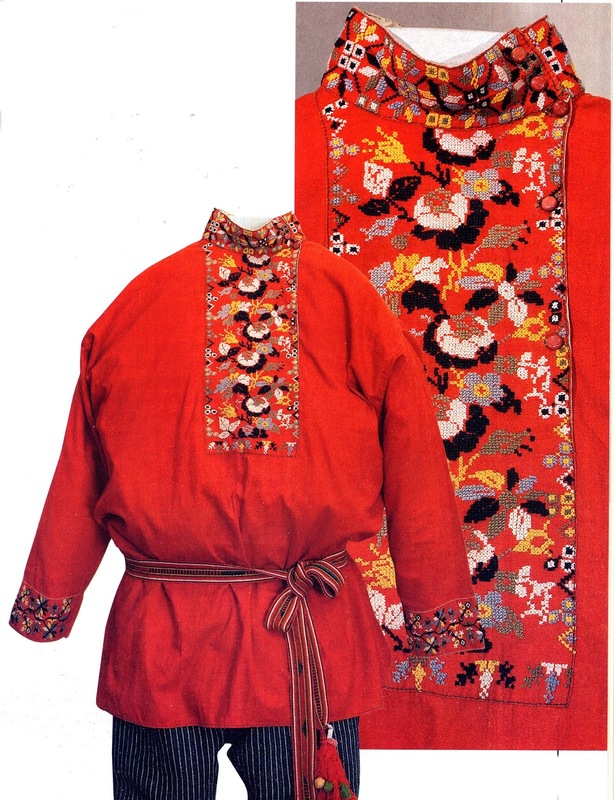 Most of the blouses had the same construction, like these next two. 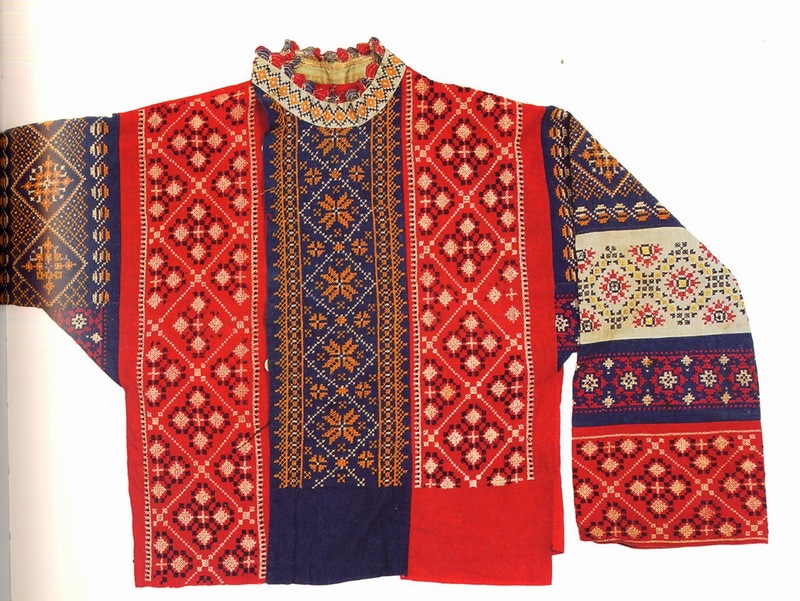 Occasionally, the top would be sewn with a traditional Slavic cut. The inset being embroidered. 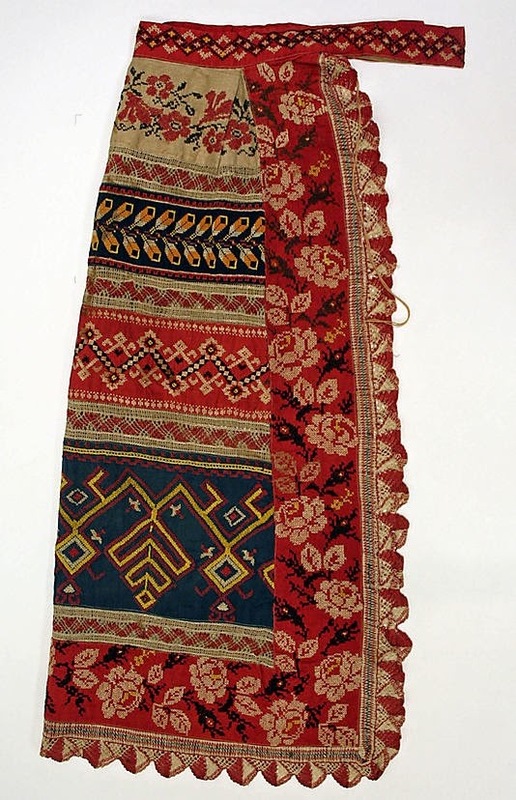 Here is one example made of colored cloth. 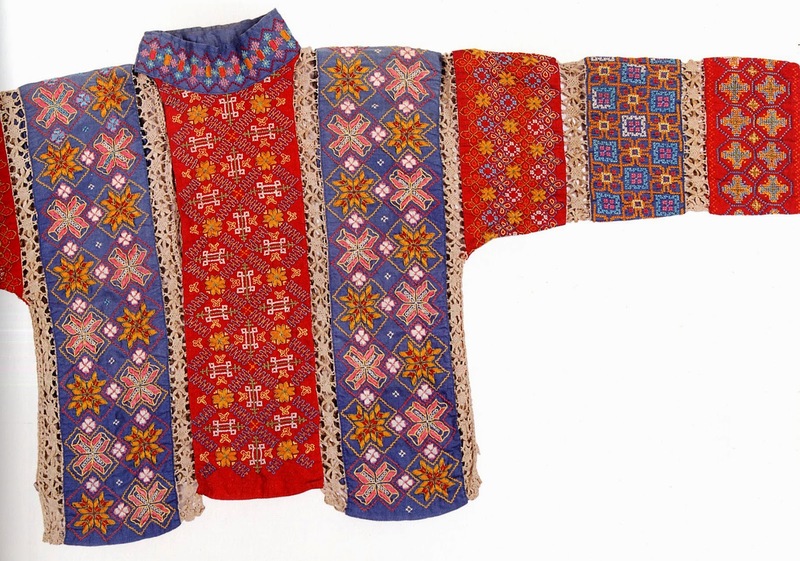 The sleeves here are the typical embroidered bands. 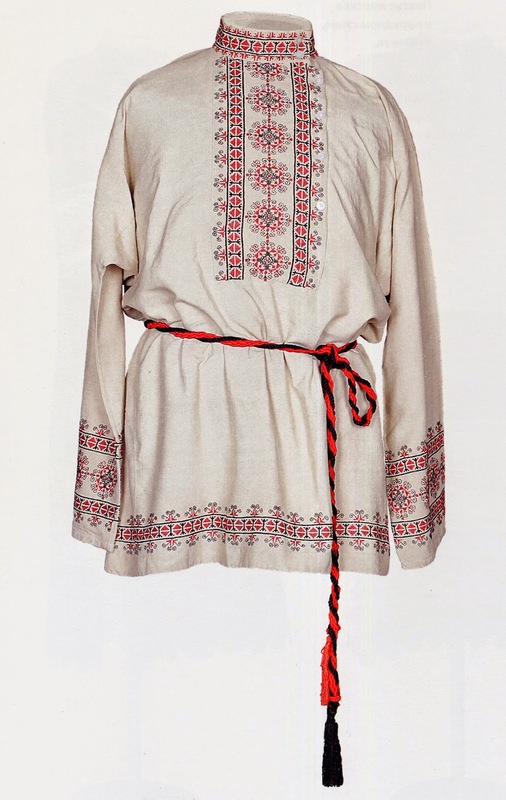 You will even find these made of white linen, so approximating somewhat traditional slavic shirts. I suspect that these were homemade, and not mass produced. Here is a fine example of such a hybrid. Here is an example of a blouse made of linen, but cut and sewn in the Victorian manner. 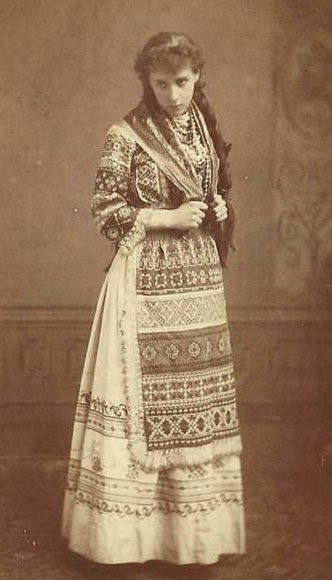 We have the garments and also a photo of the original owner, Raisa Vereshchaginaya. If only one piece was bought, it would be the apron. This would then be worn with a normal Victorian outfit. 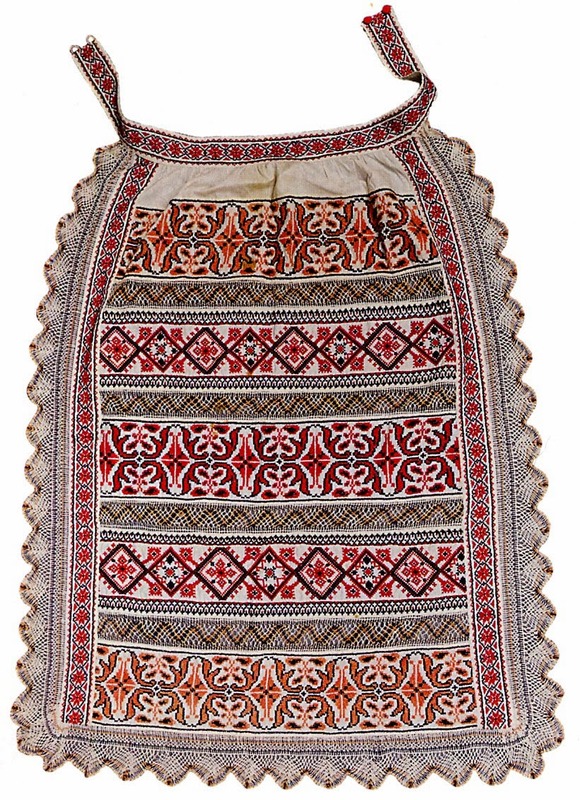 This apron was either never finished, or more likely, part of it was removed to be used on something else. 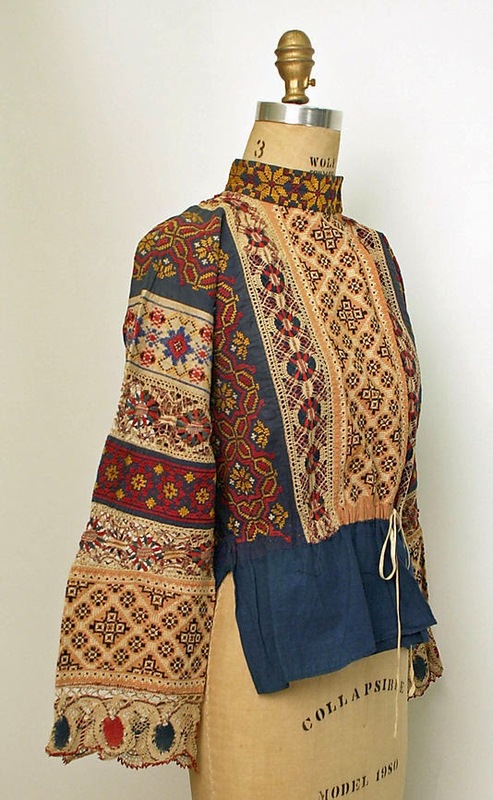 Here is an example which uses wide and open lace, and also has lace around the neck opening instead of the stand up collar. 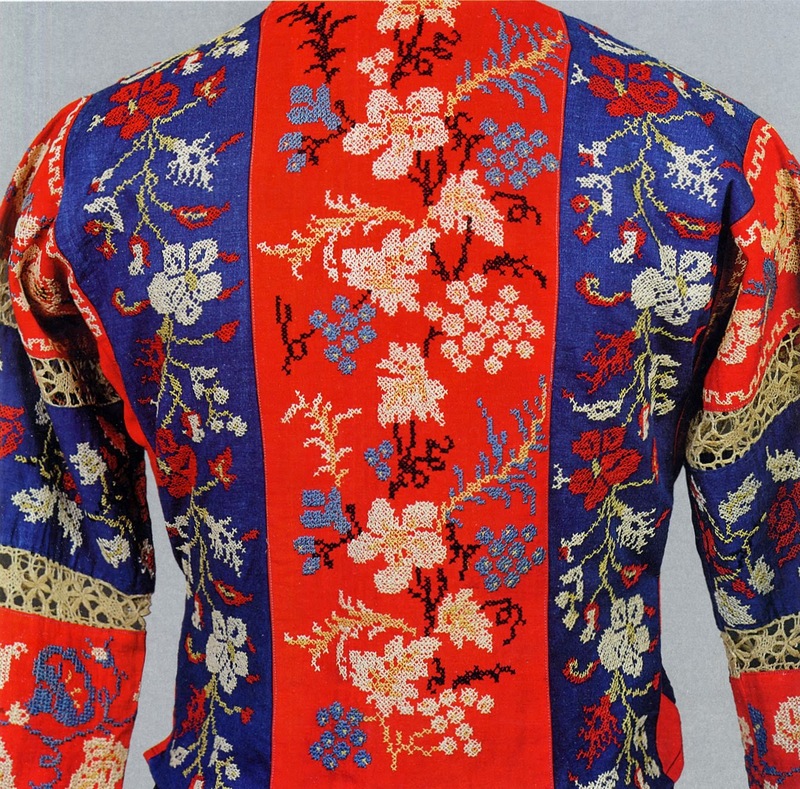 The side front and back panels are usually rectangular, but in this example, they were cut narrower at the bottom so as to make the blouse more fitted. 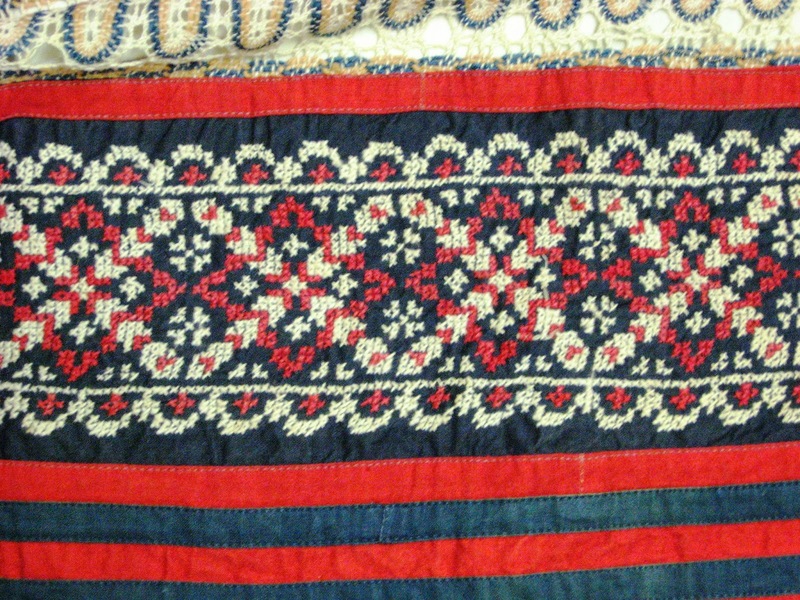 The embroidery is not always limited to cross stitch. 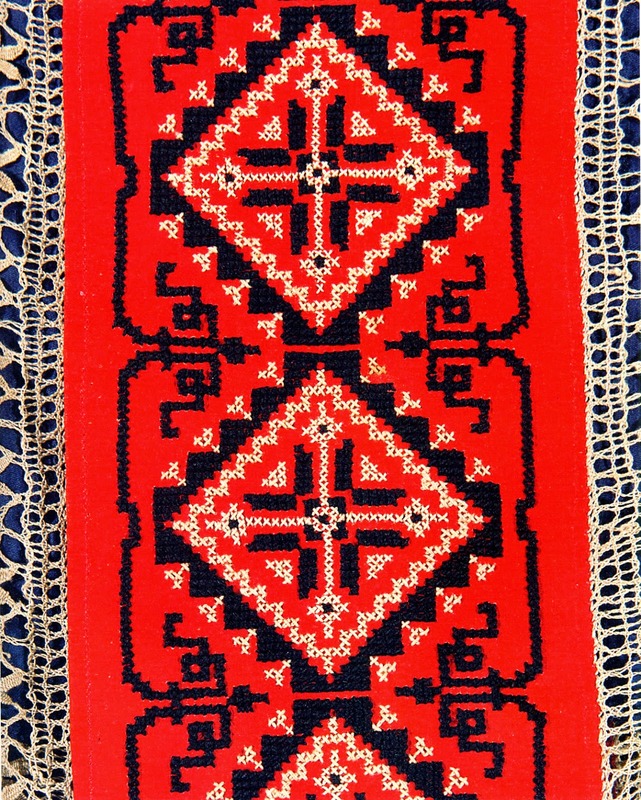 In this example, geometric satin stitch and outline stitch are also used. This example makes great use of double cross stitch, which is taken from a book, and the embroidery's effect is more texture than design. 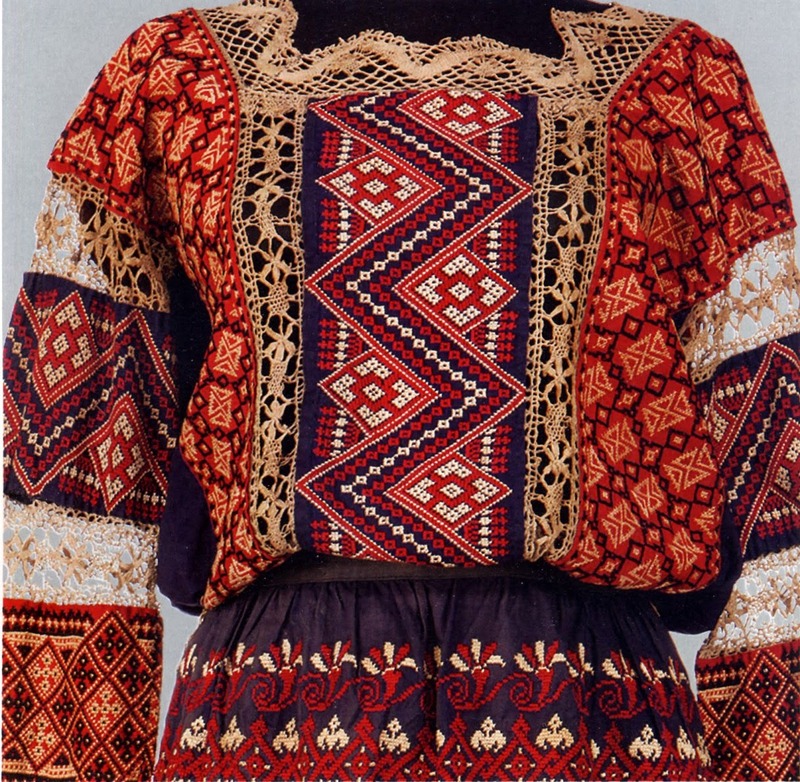 This is a rear view of the blouse. 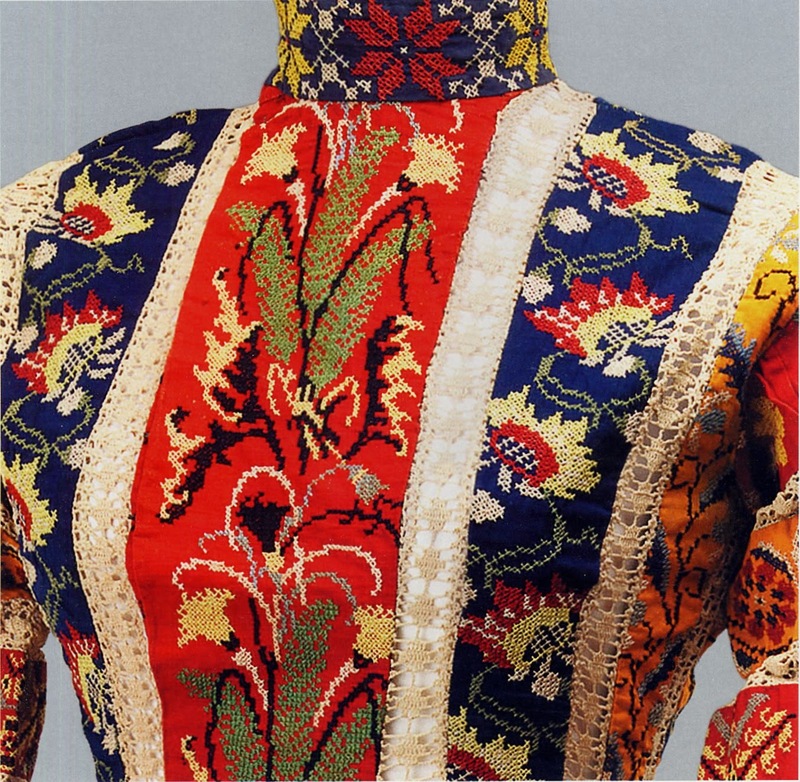 While the majority of the embroidery featured geometric designs, floral designs were not unknown. 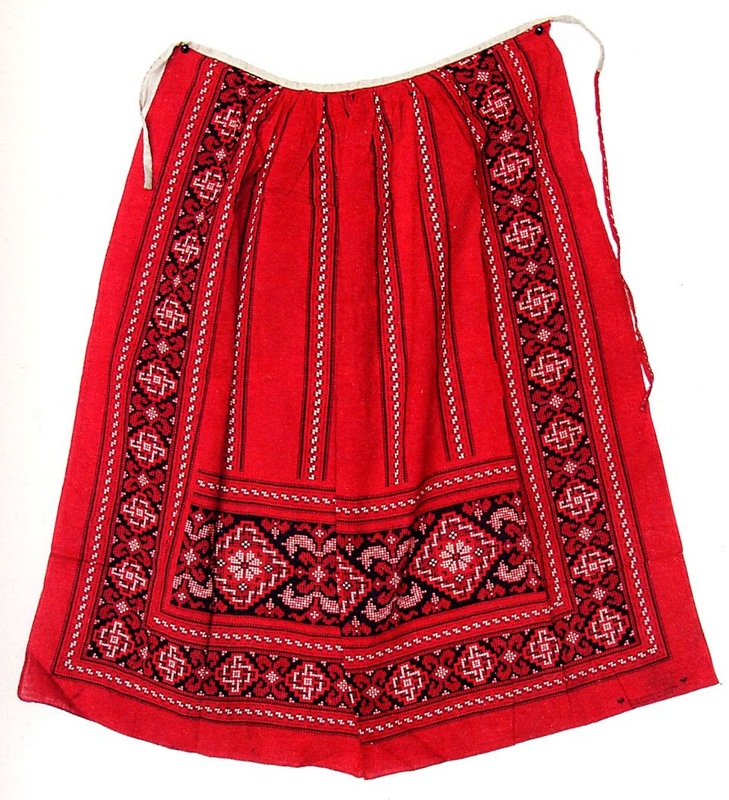 Both of these examples have the apron with zigzag lower edges. 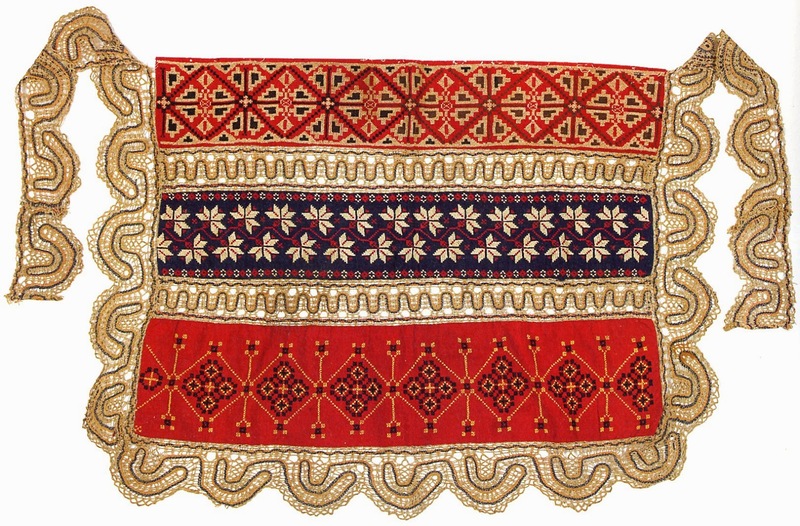 These examples have exceptionally wide lace, and each with a single design. This one is exceptionally attractive, in my opinion. And just one more truly exceptional apron. 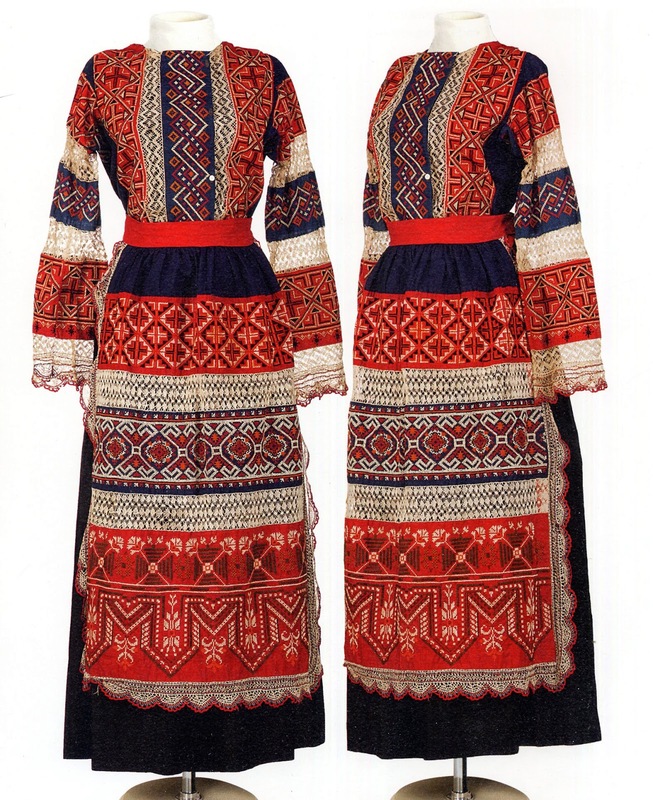 And although this type of costume was overwhelmingly made for women, there are a few examples of the men's kosovorotna made with similar embroidery. Thank you for reading, I hope that you have found this interesting, informative, and perhaps inspirational. Many of these designs would be useful for all kinds of projects, and if one could obtain the lace, an outfit like this would be relatively easy to make. Notice that no two were the same. this is really beautiful and inspiring!! i disagree with half , what is written here.